The sleek AH190 is a memory booster for iPhone and iPad, equipped with Apple MFi certified Lightning and USB 3.1 Gen 1 Type-A dual-interface. 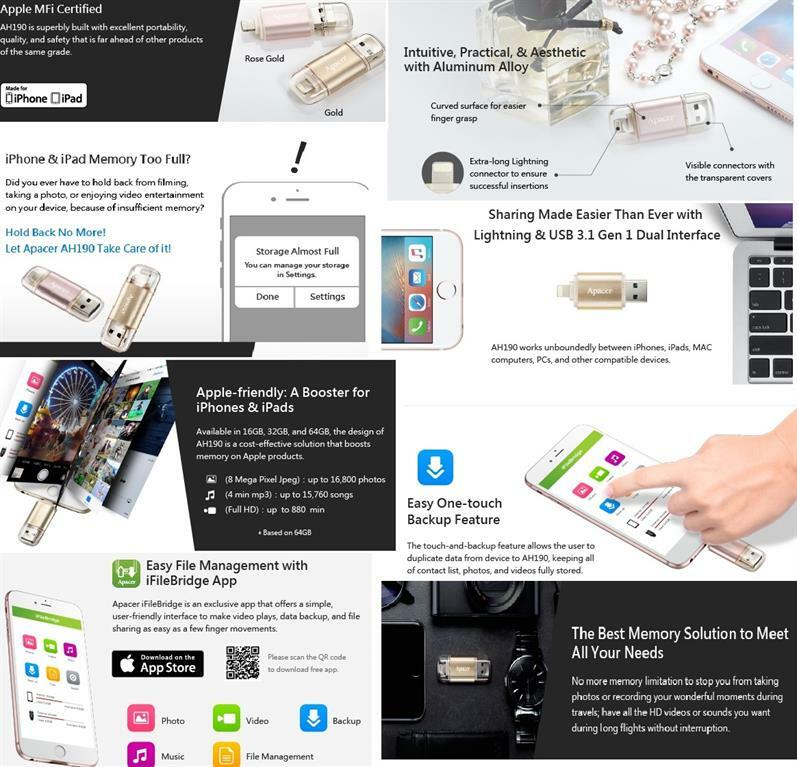 Quickly manage your files with Apacer iFileBridge, an exclusive app that offers a simple, user-friendly interface that enables easy file sharing and backup, leaving behind the need to use iTunes, wireless, or cable. Operating at 5Gbps speed, AH190 is the latest solution to make transfers of large files like videos and photos simpler than ever. 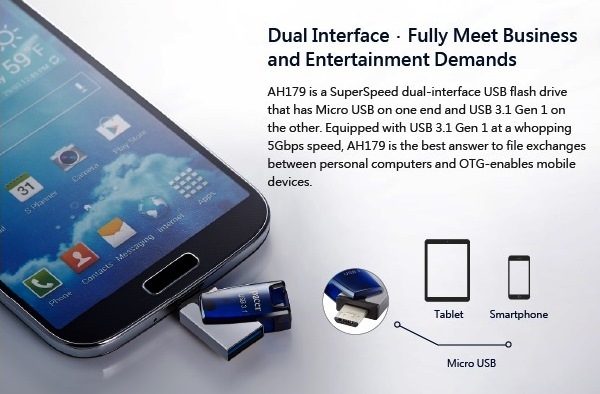 The sleek AH750 is a memory booster for Andriod, Windows and Mac with USB 3.1 Gen 1 Type-A dual-interface. Quickly manage your files with Apacer FileBridge, an exclusive app that offers a simple, user-friendly interface that enables easy file sharing and backup, leaving behind the need to use wireless, or cable. The AH750 is the latest solution to make transfers of large files like videos and photos simpler than ever. 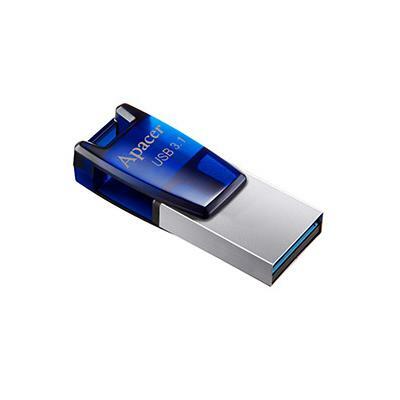 Apacer AH179 OTG USB 3.1 Gen1 Dual Flash Drive is a SuperSpeed dual-interface USB flash drive that has Micro USB on one end and USB 3.1 Gen 1 on the other. Designed with a sleek appearance and miniature size, this highly portable drive comes with 360° swivel cap that always keeps the ports covered. It is the best answer to file exchanges between personal computers and mobile products. 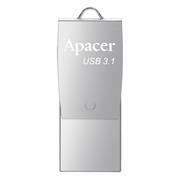 Apacer AH25B 64GB USB 3.1 Gen1 Flash Drive - Red, Retail Box, Limited Lifetime Warranty. Available in 8GB, 16GB, 32GB, 64GB, and 128GB. AH25B allows carrying mass data for portable applications and realizing a digital life of unrestricted mobility! 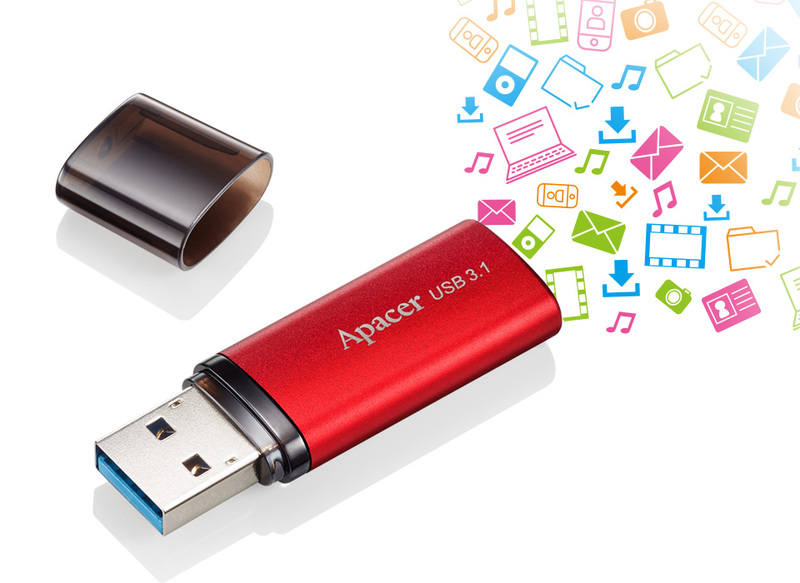 The "Sunrise Red" AH25B USB 3.1 Gen 1 shows the high contrast of red and black highlights the unique passionate nature of the product. The "Deep Valley Black" AH23B USB 2.0 reflects the cool and professional image of the user with a mysterious black matte body. The strong distinction manifests the theme of "Contrast Design" and brings more selectable styles for the user. 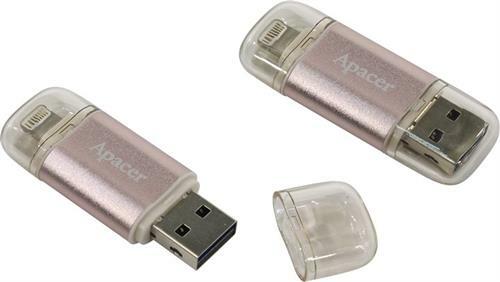 The swivel cover on AH750 OTG flash drives offer 360° spinning to ensure the unused port is always protected. The cap-less design stays conveniently attached to the unit at all times without losing. FileBridge, an app exclusively developed by Apacer, is designed for easy file management. 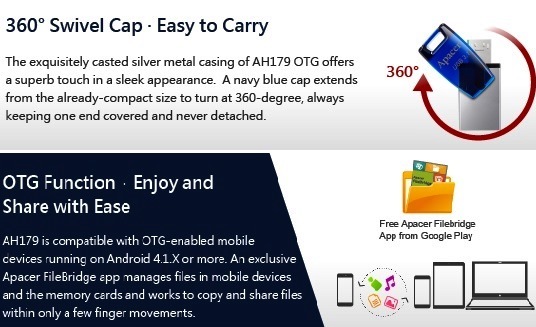 Use the app to enjoy simplified actions for file copying and sharing on your AH750. 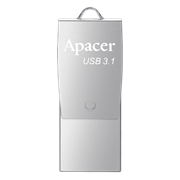 Apacer AH356 64GB USB 3.1 Flash Drive, Retail Box, Limited Lifetime Warranty. 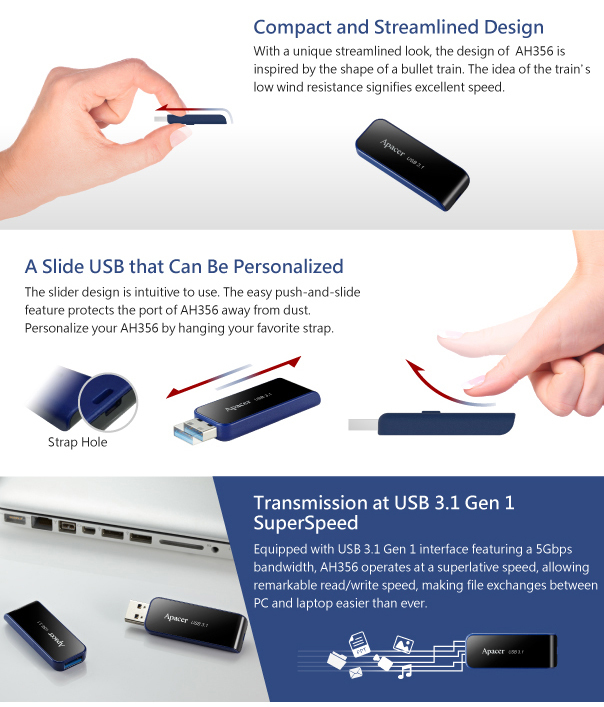 Apacer AH356 "Galaxy Express" USB 3.1 Gen 1 flash drive is inspired by stylish bullet train. 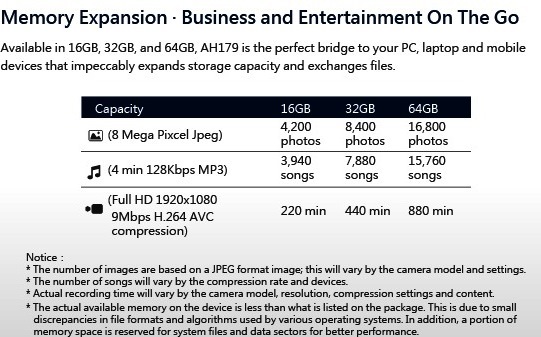 With large capacity up to 64GB, AH356 will bring users a sufficient storage. The slider design is intuitive to use. 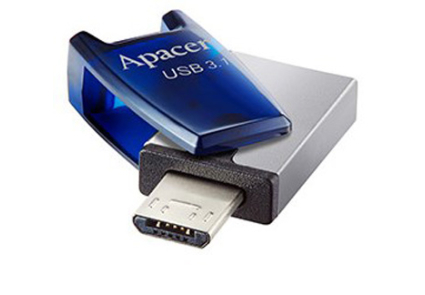 The easy push-and-slide feature protects the port of AH356 away from dust. Let's share files with someone important anytime and anywhere! 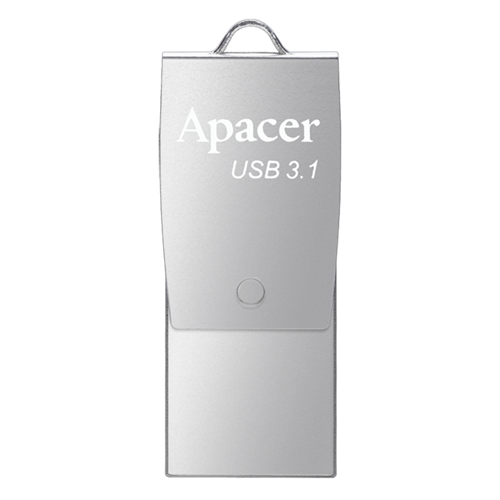 Apacer AH356 16GB USB 3.1 Flash Drive, Retail Box, Limited Lifetime Warranty. Apacer AH356 "Galaxy Express" USB 3.1 Gen 1 flash drive is inspired by stylish bullet train. 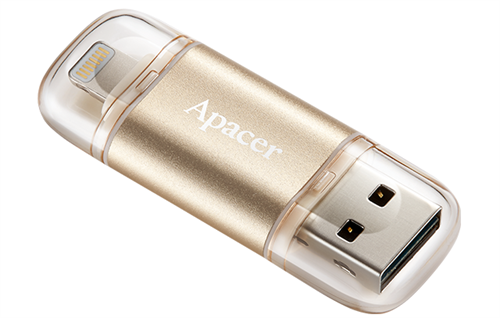 With large capacity up to 16GB, AH356 will bring users a sufficient storage. The slider design is intuitive to use. The easy push-and-slide feature protects the port of AH356 away from dust.